It works in any eyepiece so I do not need all the other attachments. It is a built in 2x lens. Can you post a shot of your set-up so we can compare against mine? Notice the trinoc on my Leitz Dialan has a built in 1.25X lens prior to the variable phototube. Not all Leitz trinoc heads are the same. Sorry, I will be out for a while ... but will resume this interesting discussion later. Thinking this through: I believe that [in common with most other eyepieces] the zoom unit itself was designed to produce a virtual image at 'infinity' ... and that the additional lens in the camera module focused that onto the film. i.e. although built as a unit, it was an 'afocal' system ... just like using your complete camera [with its lens] to photograph through the normal eyepiece of the microscope. BUT this zoom 'eyepiece' [again, in common with most eyepieces] is also capable of projecting a real image at some finite distance. ... If the optical corrections are adequate then this allows you to place a sensor directly at that location [without a camera lens] ... The evidence from einman tells us that this works nicely. It is very likely that the sensor focus will not be parfocal with the visual eyepieces. I hope that makes sense [especially as English is not your first language] ... I will try to clarify any points that trouble you. By the way my system is parfocal as well. It does not appear that the heads pictured contain a 1.25X lens as does mine. Just a comment. There are variations in the heads available for Leitz scopes. Here are the 2 Diaplans I own. The one on the right has a 1.25X lens in the quad head. It is quad because it has a camera port to the rear as well. The one on the left does not have the 1.25x lens. 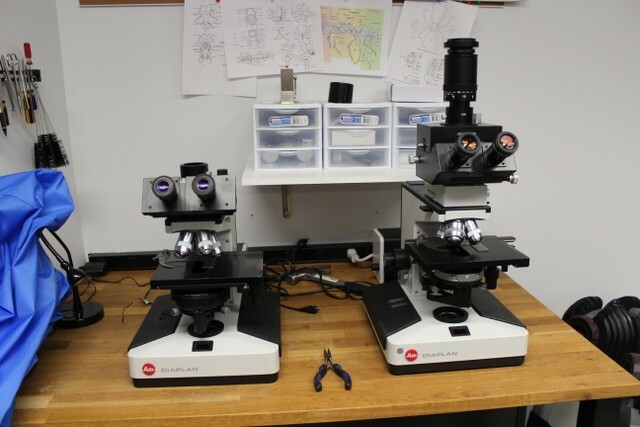 The system on the right is parfocal and is set up as described earlier. It has a wide field head and eyepieces. The FOV on the sensor is smaller than is observed through the eyepieces, in part because they are 26mm super wide FOV eyepieces. The Flange-to-Sensor distance is much smaller on the Sony ... an extension tube may be required. yes.that is what i want to express.i bought a wrong adapter.the new adapter is in the way. hello everyone ,after change a adapter,it works? i can get FOV when variable lens at 10x,but i can't get a FOV when it at 5x，how can i make it in best work situation. ... i can't get a FOV when it at 5x，how can i make it in best work situation. There may be an auxiliary lens below the condenser that you swing in with low magnification objectives. Make sure you swing it out at higher magnifications. Alternatively some condensers have a swing lens on the top. If it is on top then you need to swing it out. In others the top lens simply unscrews. Not sure which you have. As I mentioned before: You are operating this 'eyepiece' outside its design envelope. You may find, however, that an increased length of extension tube would help. ... I can only suggest that you experiment. Alternatively; you could try the 'afocal' arrangement [with a standard lens on the camera], which is much closer to how the 'zoom eyepiece' was intended to be used. You are operating this 'eyepiece' outside its design envelope. First try holding [using tripod or other stand] the Sony Nex with a lens fitted above the Zoom Eyepiece. i need time to do that ,my two hand sony has no lens ,and i have no money now. You will need to use the swing in lens on top of the condenser assuming the condenser you have has that accessory. Anything below 10x requires the swing in lens generally. I believe that condenser uses a slide in and out lens. You should be able to move the condenser top in and out as I recall. can i use industrial camera lens？ like this?,they are very cheap in china. Edit: Different C-Mount lenses cover various 'image circles' ... Longer focal length length lenses [around 35 to 45 mm] are likely to give better coverage on the Sony Nex5 sensor. ... The short focal lengths will probably 'vignette' quite severely. I'd suggest a new thread with this one, as it'll catch the eye more of some of the absolute experts here in the forum when it comes to the refurbishment, restoration and alteration of 'scopes. There are several very experienced and skilled folk here that will be able to give you some far more accurate advice than I. Looks very promising so-far though. Interested to see how this one goes. This OMAX adapter works very well with the Nikon trinocular head. The shoulders of the adapter sit right on top of the photo tube, and this supports my EOS 7D much more securely than just the 23mm end that fits into the eyepiece. I agree that a trinocular head is the way to go with this thing if, like you and me,a heavy camera is going to be used. It also eliminates the tendency of the camera to rotate if you have not achieved perfect balance, or do not have a set screw in to hold it in place.